Below you will see photos taken by Mr. Nicholas Umrichin in the Month of October, Year 1960 - yes over a half a century ago! These historic photographs show the guilding of the large church cupola and its raising to its present location on the cylindrical base at the church apex. The pictures also show the cross procession from the church, the prayer, blessing and holy water anointing prior to the raising of the cupola and cross to its current location. 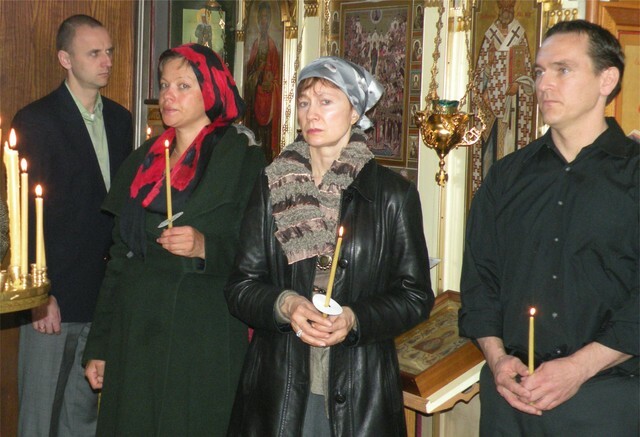 The parishioners recognized in the photos are: Mr. Nicholas Umrichin (Alex Umrichin's father), Mr. Nikita Koulomzin (Xenia Kalinin's father) and Mr. Oleg Rodzianko. Mr. Rodzianko is in the chair directing the crane during the hoisting of the Cupola and the cross. We are grateful to Mr. Alex Umrichin for providing the photos. If you have photos of the Parish and you would like them displayed on our website, it would be very appreciated if you would send them to: Serge R. Lopoukhine (Web Site Manager) www.srlop@frontiernet.net. 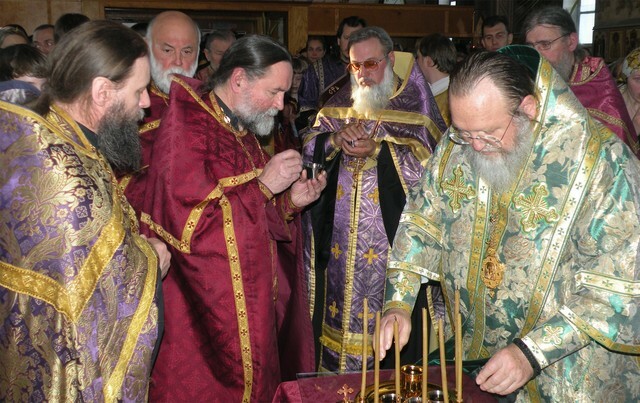 On Tuesday, October 7, 2014, the Synod of Bishops, during a regular meeting, presided over by His Eminence Metropolitan Hilarion of Eastern America and New York, First Hierarch of the Russian Orthodox Church Outside of Russia, heard and granted the intercession by Vladyka Hilarion on the awarding of the second cross to Mitred Protopriest George Larin to mark the 45th anniversary of his priestly service. 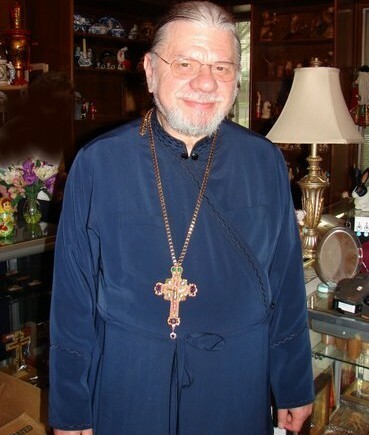 Fr George was ordained to the priesthood by Bishop Laurus (Skurla, future Primate of the Russian Church Abroad), on December 7, 1969, and appointed second priest under Protopriest Seraphim Slobodskoy, Rector of Holy Virgin Protection Church in Nyack, NY. 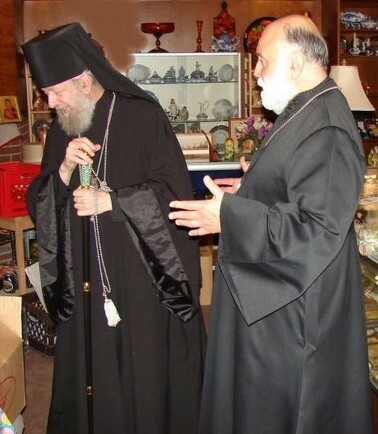 Since 1971, after the death of Fr Seraphim, Fr George was appointed rector as well as the Director of the parish school. Fr George also served in the administration of the Eastern American Diocese for over 40 years, and fulfilled many obediences lain upon him by the Synod of Bishops. On October 5, Fr George celebrated his 80th birthday. 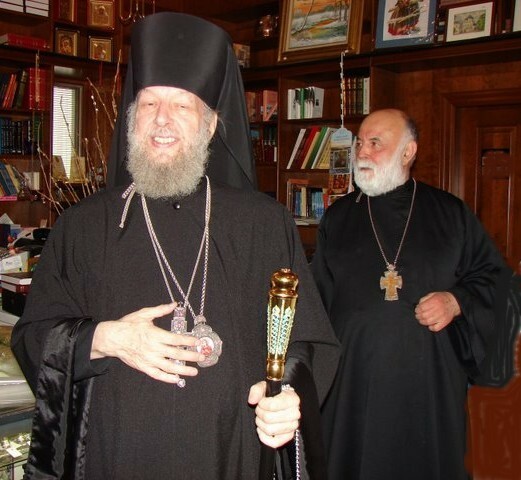 With the blessing of Metropolitan Hilarion, His Grace Bishop Nicholas of Manhattan, Vice Secretary of the Synod of Bishops, granted the award to Fr George during the minor entrance of Divine Liturgy at Holy Virgin Protection Church on its feast day. The Kursk-Root Icon of the Mother of God "of the Sign" was present at the service. Despite the workday, the archpastor, many clergymen and parishioners were present to share a fraternal trapeza luncheon, during which warm congratulations to Fr George were expressed by all. Please see below the photo gallery of the Feast Day and the award of the second cross to Mitred Protopriest George Larin. His Grace Bishop Jerome arrived at 9:15 AM to our Parish on a bright Sunday morning. 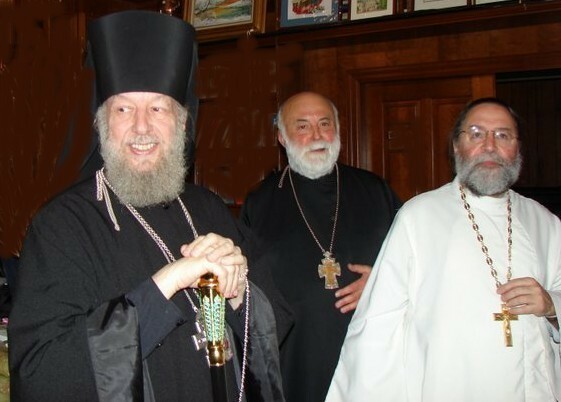 His Grace was greeted by Archpriests George Larin, Ilia Gorsky, Protodeacon Dimitri Temidis and Holy Virgin Protection Orthodox Church parishioners. 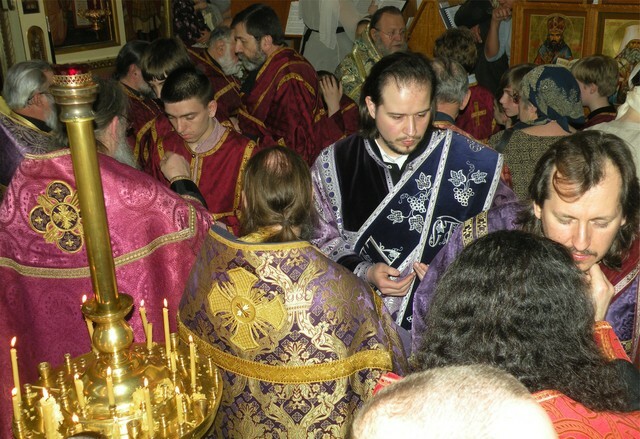 During the service, Altar server Ivan Lopuchin was awarded the right to wear the orarion. His Grace officiated the Divine Liturgy on this day in our Parish for this is the Patron Saints of the Parish Sisterhood. His Grace's sermon centered on the Gospel Reading of this day: Mark 15:43-16:8, the commemoration of the Myrrh Bearing women and Joseph of Arimathea. His Grace ended his sermon by underscoring the Gospel's final verse, Mark 16:8 " So they went out quickly and fled from the tomb, for they trembled and were amazed. and they said nothing to anyone, for they were afraid." His Grace elaborated this phrase that then and now we find ourselves afraid to prophesy our faith and belief in the resurrected Lord. We need to overcome the fear of what people will say of us if we visibly show that we are Orthodox Christians. We instead do say many things which are just the opposite of what we should say and do - such as gossip, speak ill of people, pass judgement. The Feast Day continued with the clergy, visitors and parishioners in the Church Hall where the Sisterhood of the Parish invited all to take part in a sumptuous Trapeza. I have attached photos taken that day. The Vursta family with children, began our season of serving delicious lunches after Divine Liturgy. Over 50 people came to partake of a delicious lunch of BBQ chicken, pork, mashed potatoes, kale cabbage salad, marinated beets, corn and bean salad, coleslaw, buns, kvass, lemon water, coffee tea, carrot cake, fruit salad and frozen dairy berry mousse. Kudos to the chefs, earning over $200.00 which was added to the Sisterhood account. The celebration of the Feast Day of our Parish began on Sunday evening at vigil when the Parish Clergy met the Miraculous Kursk Icon of the Theotokos. Vigil was celebrated with visiting clergy: Archpriest Seraphim Gan from Sea Cliff, Archpriest Nikolai Olhovsky - guardian of the Kursk Icon from Synod, Protodeacon Joseph Jarostchuk from Utica NY and Deacon George Temidis from Mahopac. On a beautifull sunny fall morning, the Parish clergy, Archpriest George Larin and Archpriest Ilia Gorsky and parishioners met and greeted His Eminence Metropolitan Hilarion. 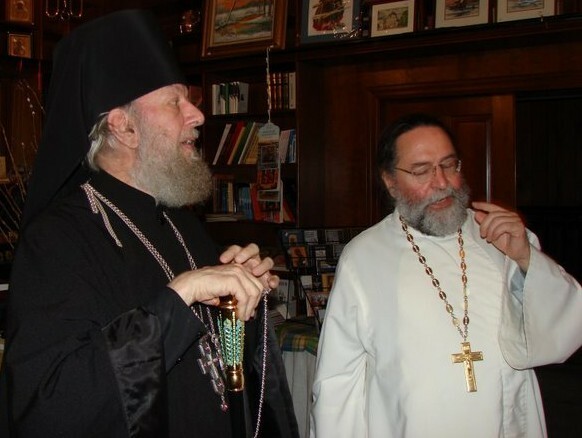 Archpriest Victor Teshkovsky from Mahopac, Archpriest Alexander Donchenko from Poughkeepsie and Archpriest Nikolai Olhovsky came to participate in the Divine Service. 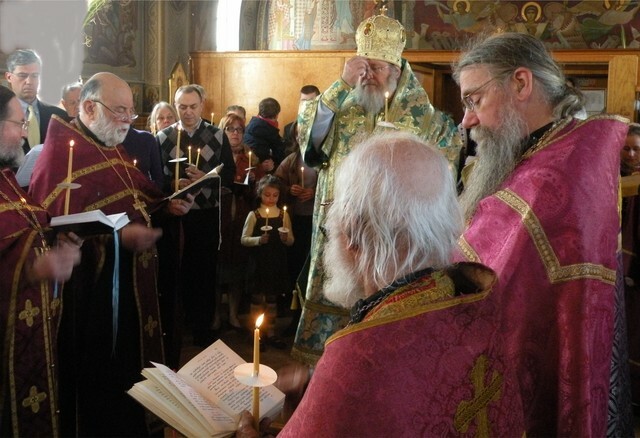 The Service was embellished by the participation of three protodeacons: Father Joseph Jarostchuk, Father Dimitri Temidis, Father Serge Arlievsky and Father deacon George Temidis. 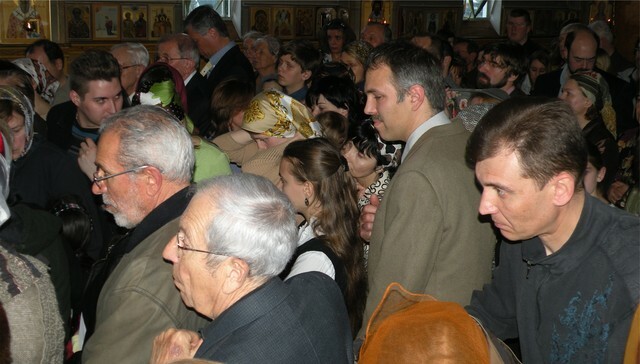 After the Divine Liturgy, a crucession around the Church was celebrated. The photos (slide show) portray the jubilant and spiritual uplift of the Feast Day. Icon painter and restorer, Ms. Ekaterina Piskareva, has been hired by the Rector and the Parish Council to restore the original half-a-century old icon murals of the Church. The work began in September of 2012. Ms. Ekaterina Piskareva began with the western wall Icon, depicting The Last Judgement. The October 2012 photos in slide show, show the restoration of the icons depicting the major Old Testament events. As of today, half of the Nave of the Church has been completed. Scaffolding has been moved to the front part of the Nave and modified so as to give access to the New Testament Mural Icons. Photos will be taken shortly to record the progress of the Project by the talented restorer. 1- Father George Larin- Rector of the the Holy Virgin Protection Church in Nyack, NY. The Church was filled to capacity. Many came from neighboring parishes - as far as Kingston, NY and Stratford, CT. After the Sacrament, the clergy and laity were invited by the Rector to partake of a lenten meal in the Church hall. 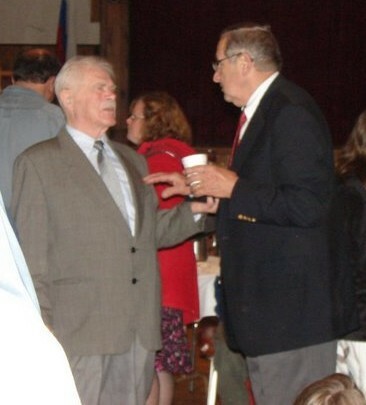 As many as 150 guests joined the Nyack parishioners and clergy in the Church Hall. Parish of the Holy Virgin Protection Russian Orthodox Church. On a bright Saturday afternoon, at 12 noon, a delegation of West Point Cadets came to the Parish of the Holy Virgin Protection Russian Orthodox Church. The visit was arranged between Dr. Olga Vladimirovna Dobrunoff, Russian Professor at the United States Military Academy and the Rector, Archpriest George Larin. Accompanying the Professor was Lieutenant Colonel Michael Nerstheimer; Cadet Jonathan Stamp; Cadet Ivan Ivaschenko and Cadet Ranson Sammons. The cadets were welcomed by the Rector and several Parishioners: Mr. Alexander Sergeevich Alimov-Senior Consultant to the Russian Federation at the UN; Colonel and Mrs. Richard Clark; Mr. Kiril Mihailovich Zaporoshan-Parish Property manager and his wife, Maria Borisovna – Parish Bookstore Manager; Protodeacon Sergei Arlievsky, Russian Church School Supervisor; Matushka Catherine Yurivna Larin; Mrs. Anastasia Borisovna Lopoukhine – Elder Sister Mr. Serge Raphailovich Lopoukhine, Treasurer. The visitors are members of the Russian Club at the Military Academy. They expressed an interest to visit our Parish to see the school, Church and meet several parishioners to get a better understanding of the Russian culture expressed in our Parish. The tour began with a visit of the school. Protodeacon Serge Arlievsky gave a very interesting and detailed talk and tour of the School; its history; longevity and successes. It was pointed out that the school history and activities have been recognized by Russian Federation Education authorities and school representatives were invited to participate in several occasions at conferences held in Russia. In fact, some of our graduates- thanks to the knowledge of the Russian language, history and culture have been able to achieve prestigious posts in the academic, business and political worlds- Foreign Bank Presidents in Russia, U. S. President interpreters and the like. The visitors then were given the tour of the Church. Two of the cadets are of the Orthodox Faith – Antiochan and Ukrainian Orthodox Churches and they expressed that the church visit was ’close to home’. The tour emphasized the symbolisms, iconography, murals, architecture and the essence of the Orthodox Services. The Cadets and their officer with the Professor witnessed the concluding school prayer of the students in the Church. 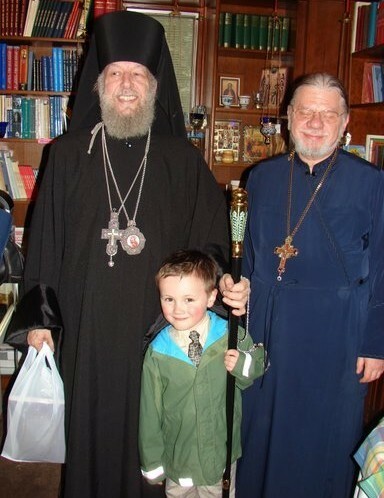 The two Orthodox Cadets – Ivan Ivaschenko and Ranson Sammons, also joined the children in venerating the Icon of the Optina Elders (their Feast day) and receive a priest blessing from Father George Larin. 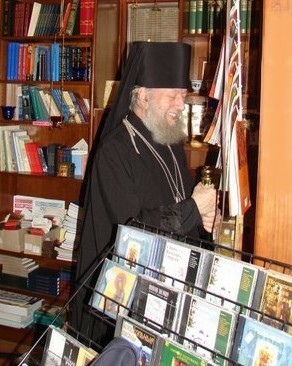 The next stop on the tour was the Parish Bookstore where Maria Borisovna Zaporoshan met the guests. The Russian exhibits were of much interest as well as the books, records and icons. The tour ended with a bountiful meal served by the Sisterhood in the church hall. The lunch comprised of Russian fare: Red-beet borscht with sour cream; piroshky with meat and cabbage; pelmeni and finally with a delicious dessert: cherry-based Kissel. During the meal many of the parishioners related their life stories as to how each one of us came to the United States and how we have become members of this Parish. We parted with the feeling that this was one of the first visits from the Academy and others will be very interested to visit us once again as well as other Russian sites and Parishes. In the summer of 1976, the cupola was taken down from the church turret for re-gilding. A crane was hired and the street blocked off for the good part of the day. Selected parishioners climbed on top of the roof and into the turret and unfastened the cross and the cupola. The cross was removed and then the cupola was slowly lowered while the parishioners and neighbors looked on. The cupola on its stem was laid horizontally on cross pieces on the lawn, east of the church. Parishioners were then instructed how to re-gild the cupola. While manually turning the cupola, designated parishioners applied adhesive by paint brush to the surface, while other volunteers applied gold dust from 4 inch square papers onto the wet glue. the process lasted several days. The photographs shown above captured some of our workers and onlookers. In the photo with the crane, standing to the left of the crane is Mr. Nikolai Zarahto. In the same photo under the one way sign, stands our current rector Father George Larin. 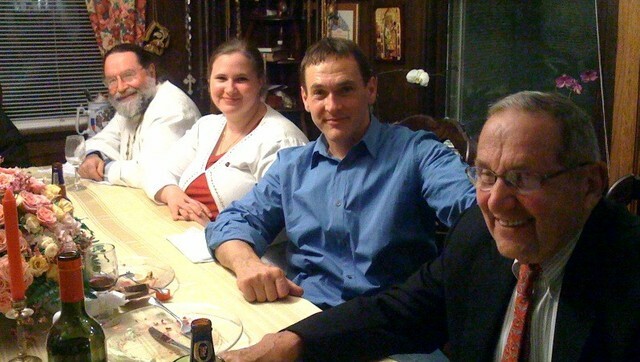 In the second row and the far left photo, three parishioners are in the picture: the young and now Archpriest Ilya Gorsky; Mrs. Elena Penkrat and Father George Larin. In the same photo, in the background on the left, Irina Gorsky looks on. It has been reported that this icon, located in the Cathedral of Christ the Saviour in Moscow wept miraculously during the election process of the new Patriarch Kirill. This Icon is also called the “Simeon’s Prophecy” Icon. According to the Evangelist Luke, the Holy Spirit told the righteous Elder Simeon, the God-receiver, that he would not die until he had seen the Messiah. Thus, forty days after the Divine Infant’s birth, His parents brought Him to the Temple of Jerusalem, and Simeon “was inspired” to come there as well, and took the Infant into his arms (hence the title “God-receiver”), and pronounced those famous words that we use in St. Simeon’s Prayer, “Lord, now lettest Thou Thy servant depart in peace, according to Thy word….” (Lk. 2:29). Just as Christ would be pierced with nails and a spear, so the soul of the Most-pure Theotokos would be pierced by the weapon of sorrow and pain in the heart, when she saw her Son’s suffering. After that, the hidden thoughts of the people regarding the Messiah would be revealed, and they would face a choice: to be with Christ, or against Him. Such an interpretation of Simeon’s prophecy became the subject of a number of icons of the Theotokos. All those who turn to this Icon in prayer sense that with the softening of evil hearts comes and easing of spiritual and physical suffering. People come to recognize that when they pray for their enemies before this icon, their feelings of enmity are softened, and that strife and hatreds leave, giving way to kindness. A Moleben and an Akathist was officiated. Over 200 worshippers came that evening from many parishes. The church was filled to capacity and the solemnity and reverence to the holy Myrrh streaming Icon was felt by all. On Friday evening, our parish was honored by the visit of the Miraculous Myrrh streaming Icon of the Theotokos of Iveron of Hawaii. The Icon is a replica of the Iveron Icon that Brother Jose Munoz received on Mount Athos which became a Myrrh streaming as well as healing Icon. Brother Jose traveled to many Orthodox Parishes with the Montreal Iveron Icon of the Theotokos until his martyr death in Greece many years ago. 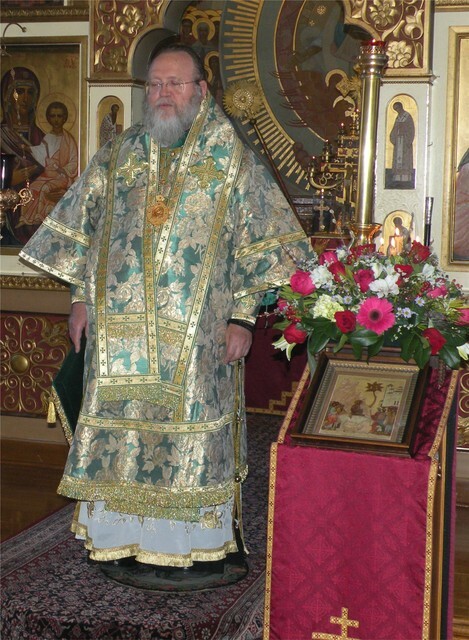 With his death the miraculous Icon disappeared. With reverence and faith towards the Mother of God, many copies of the icon were printed. The Icon that came to our parish this evening was such a copy printed in Sofrino, Russia- a large producer of Orthodox icons, vestments, church articles, candles and other clerical items. Sofrino is located approximately twenty miles south of the much revered Russian Monastery and Holy place, Saint Sergius Lavra. The Icon, laminated on a wooden backing, was given by rector, Father Anatole. to his Reader Nectarios of the Orthodox Church in Honolulu which incidently was named in honor of the original Iveron Icon of Montreal. 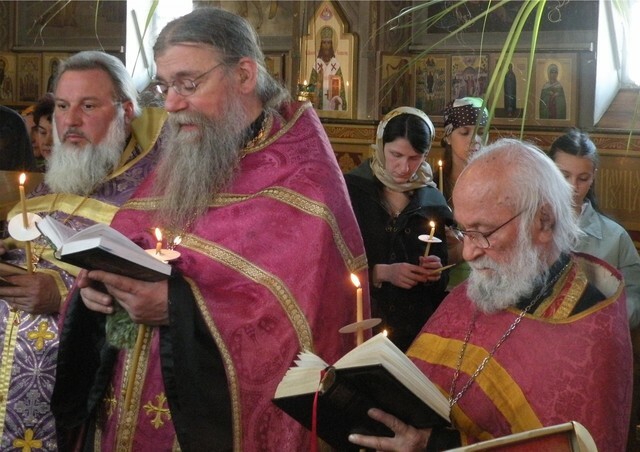 With the blessing of Archbishop Kirill of San Francisco and the Western Diocese, and with an ukaz (decree) from the Synod of ROCOR, Reader Nectarios travels to all ROCOR, OCA, Greek, Serbian and Antiochan Orthodox Churches with the Myrrh streaming Icon. 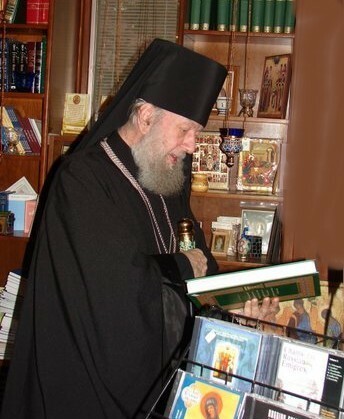 Reader Nectarios-keeper of the miarculous Icon was driven to our parish by Father Victor Boldewskul, Rector of the Ortodox Church of the Epiphany in Roslindale, MA-outside of Boston. 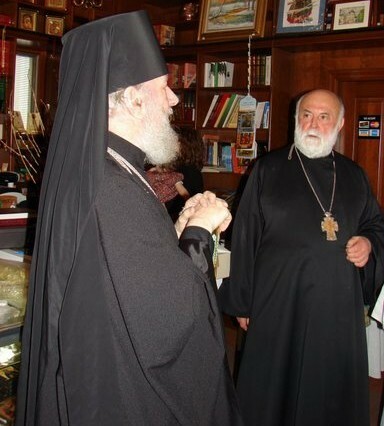 This evening the Icon was met by Orthodox as well non- Orthodox believers alike. The Church was filled to capacity- as one sees during the Great Feasts of Easter and Christmas. The Icon was met by our Rector, Mitered Father George Larin along with Father Alexander Donchenko of Saint Nicholas Orthodox Church in Poughkeepsie, NY; Father Protodeacon Sergei Arlievsky of the Orthodox Convent of Novo Diveevo in Spring Valley, NY; Father Protodeacon Pavel Volkow of Saint Seraphim of Sarov Orthodox Church in Sea Cliff, NY and Father Deacon Nathan Mousselli of Saint Alexander Nevsky Orthodox Cathedral in Howell, NJ. Our Rector, Father George Larin celebrates his Namesday! On May 6th, Our Parish Rector, Father George Larin celebrated his Patron Saint's Day - Saint George the Dragonslayer. 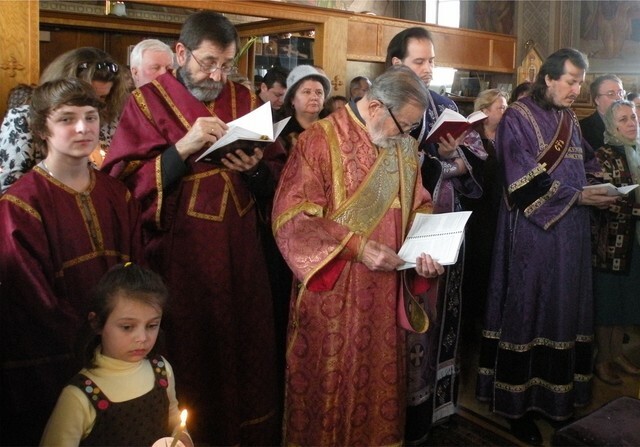 All night vigil and Divine Liturgy services were celebrated. In the evening, Matushka Catherine Larin, prepared a formidable open house celebration for all who came to wish our Parish Rector health, happiness and many years! 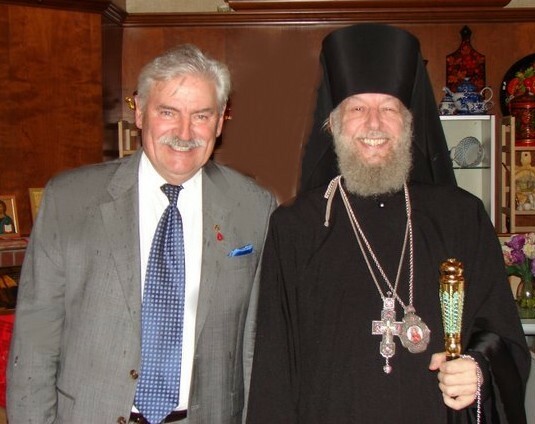 Many parishioners came as well as clergy including Mitered Archpriest Father Alexander Lebedeff Rector of the Holy Transfiguration Orthodox Cathedral in Los Angeles, CA. Father Lebedeff was on the East Coast because of the Synod of Bishops Meeting that was taking place in New York City (May 5-7, 2009). Wonderful lenten dishes were prepared by Matushka. Wine flowed and lively interesting converstion was had by all! Several pictures , taken by iphone, by Mrs. Marianna Larin show pictorially the warm and happy evening that transpired in the Larin home! 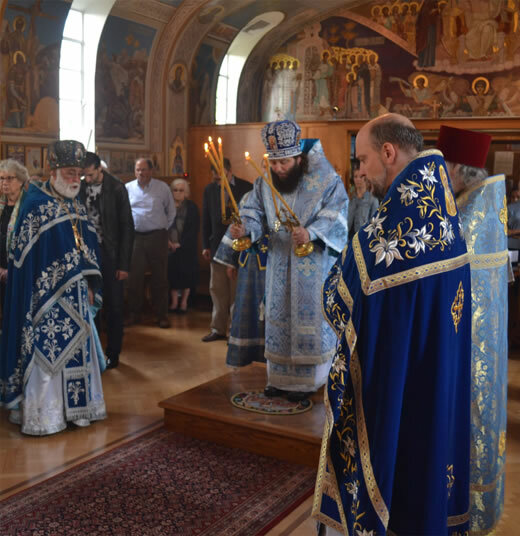 On May 3rd, the Sunday commemorating the Myrrh Bearing women, the Feast Day of the Parish Sisterhood, His Grace, Bishop Jerome Vicar Bishop of Manhattan celebrated the Divine Liturgy at the Holy Virgin Protection Russian Orthodox Church in Nyack, New York. 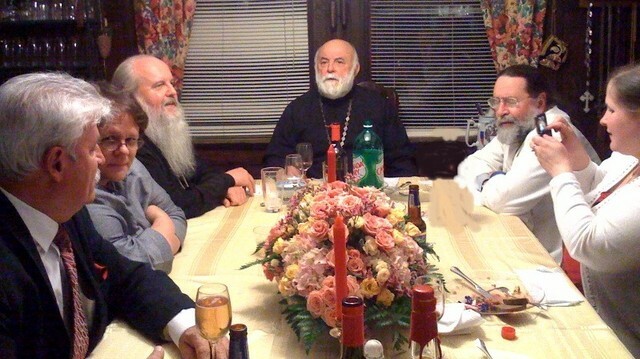 Co-celebrants were the Rector of the Parish, Mitered Archpriest Father George Larin, Assistant Rector, Archpriest Ilya Gorsky and visiting Hieromonk Father John Magram. Father Evgeny Kallaur served beautifully as always, as the deacon at the Pontifical Service. After the Divine Liturgy, the Bishop, clergy and parishioners were invited to the Parish Hall by the Sisterhood to a sumptuous buffet luncheon. Even though we braved inclement weather outside, a warm and congenial atmosphere prevailed in the Hall. 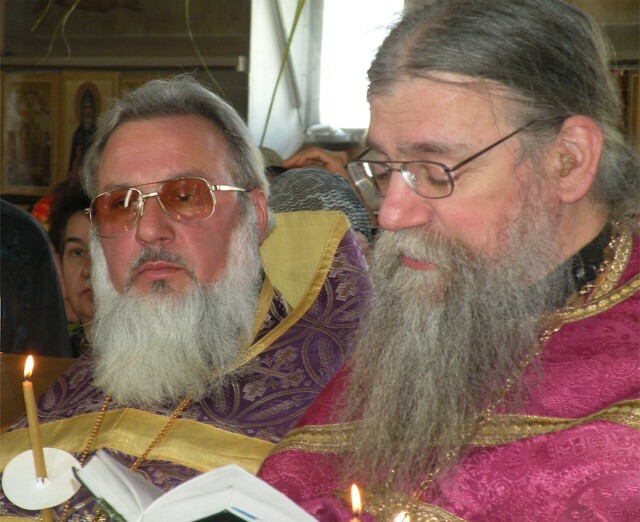 "Mnogaya Leta - Many Years" were sung to our subdeacon, Mr. Andrei Komendantov, who ten years ago was tonsured to his current rank. Also prayers were sung for the Sisterhood and elder sister Mrs. Anastasia Lopoukhine. His Grace, Bishop Jerome, an admirer of the printed word, visited with Father John Magram the Parish's bookstore and was impressed with our collection and walked away with several purchases, much to the delight of our Store Manager, Mrs. M. Zaporoshan. Pictures taken by Ms. Elena Miloradovitch, our Choir Director, depict the bookstore visit. Father George Larin, Matushka Katia Larina, Moura Zaporoshan, Anastasia and Serge Lopoukhine visited Father Vadim and his Saint John of Kronstadt Parish with a Paschal visit on the evening of April 28th, 2009. This time, we visited their new chapel located on the corner of Brighton 1st Place and Lane. The parish aquired their new place on January 1st, 2009. Their new place of worship is at least ten times larger than the previous chapel! The parish now has two buildings that houses the new chapel, dormitories for the needy; rental apartments; workshops; bookstore and kitchen. After a molieben and akathist to the Theotokos, the parishioners, Father Vadim and the Nyack visitors shared a sumptuous Paschal Trapeza. 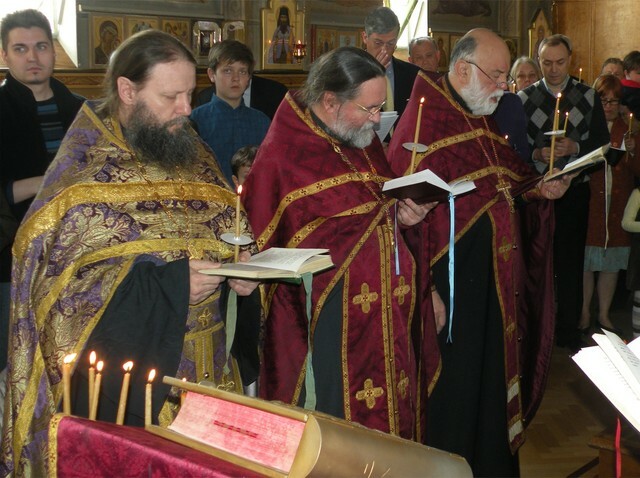 Father George Zelinin (Patterson, NJ), Father Ilya Gorsky and Father George Larin reading of the Gospel. At 4PM, on April12th, Palm Sunday, The Sacramental Rite of Holy Unction was performed in the Holy Virgin Protection Russian Orthodox Church in Nyack, New York. Officiating the sacrament was His Eminence, Metropolitan Hilarion. Vladyka was joined by Parish Rector Mitred Archpriest George Larin; Assistant Rector, Archpriest Ilya Gorsky;Father George Zelinin, St. Michael Orthodox Church, Newark, NJ; Archriest George Lardas, St. Nicholas Orthodox Church, Stratford CT.;Archpriest Nikolai Babijtchouk, rector of the Orthodox Church of All Saints of Russia, Pine Bush, NY. 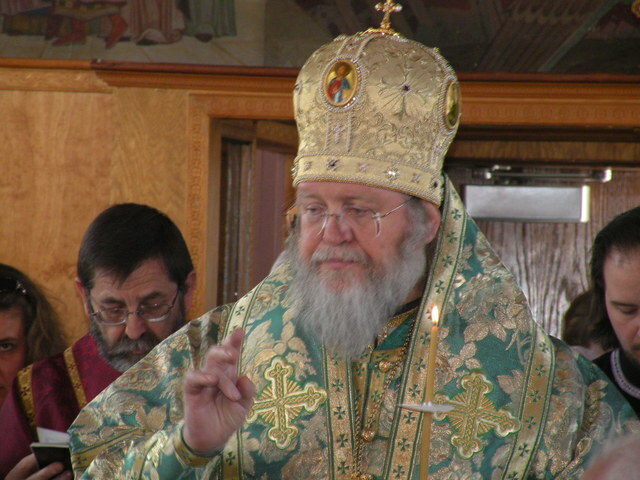 ; Father Vadim Arefiev, rector of Saint John of Kronstadt Orthodox Chapel, Brooklyn, NY. 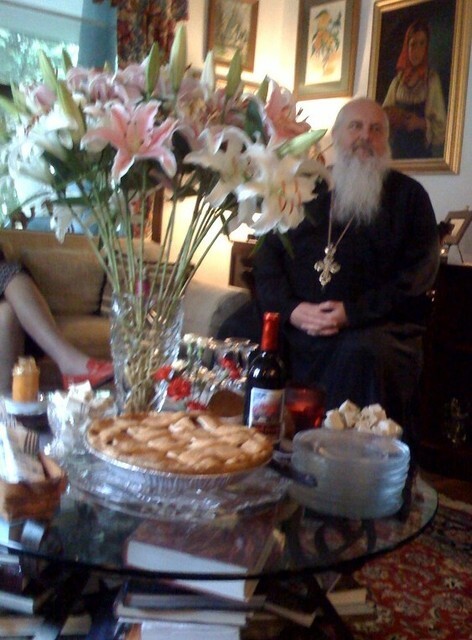 and Father Ilya Gun of the Orthodox Church of the Nativity of the Most Holy Theotokos, Mahopac, NY. Attending and serving were three deacons: Archdeacon Father Evgeny Burbello, Protodeacon Father Serge Arlievsky and Deacon Evgeny Kallaur. Many worshippers from the adjoining parishes came and joined the Nyack parish for the Sacrament of Holy Unction. The church was overflowing. The service was solemn, reverential and beautiful. After the service, the worshippers and clergy were invited to the Church hall to a bountiful supper-buffet prepared by the parish sisterhood and parishioners. 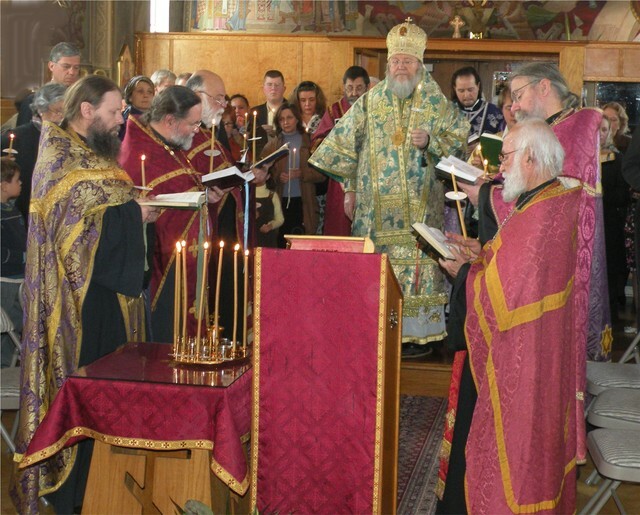 Over 150 Orthodox Christians - clergy and laity - on November 1st, 2008, converged on Utica New York to be part of the celebration of the Feast Day of Saint John of Kronstadt. 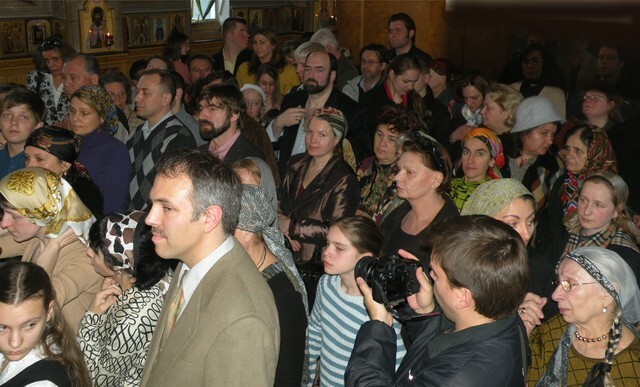 The Saint John of Kronstadt Russian Orthodox Church in Utica New York was filled to capacity. It was here in 1963, when the Russian Orthodox Church Outside Russia, (ROCOR) performed the Rite of Canonization of the Russian Pastor - Saint John of Kronstadt. The Temple prior to the Canonization was named in honor of Saint John of Rilski - the saint's name that St John of Kronstadt was given at his christening and bore all his life! 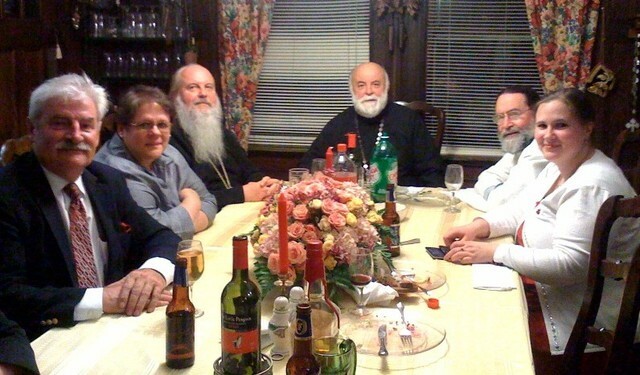 Clergy came from the Holy Trinity Monastery in Jordanville (Archimandrite Luke- Abbot of the Monastery, Protodeacon Victor Lochmatov and deacon Nikolai Olhovsky); from Boston area (Protodeacon Alexander Jarostchuk); from Nyack (Mitred Archpriest George Larin); from Red Bank, NJ (Archpriest Serge Lukianov); from Seacliff NY ( Deacon Eugene Kallaur) and other priests and deacons that alas,I cannot name since I did not have the opportunity to meet them! 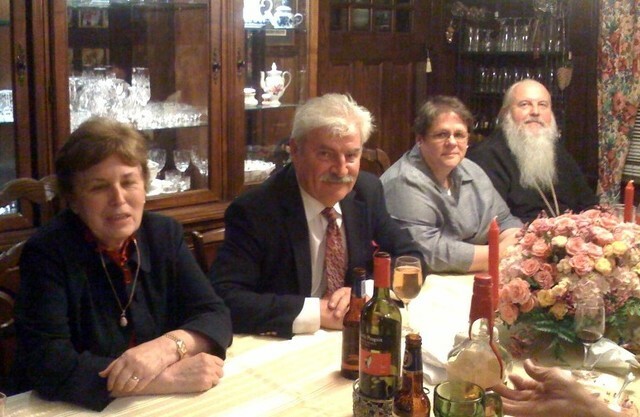 Laity also came from other parishes - to name a few: Poughkeepsie (Mr. and Mrs. George Nikolsky); Nyack (Matushka Catherine Larin, Mr. and Mrs. Kiril Zaporoshan, Mr. and Mrs. Serge Lopoukhine) Boston, Hartford, Rochester.. Many seminarians from Jordanville came and assited in the singing of the Divine Liturgy. 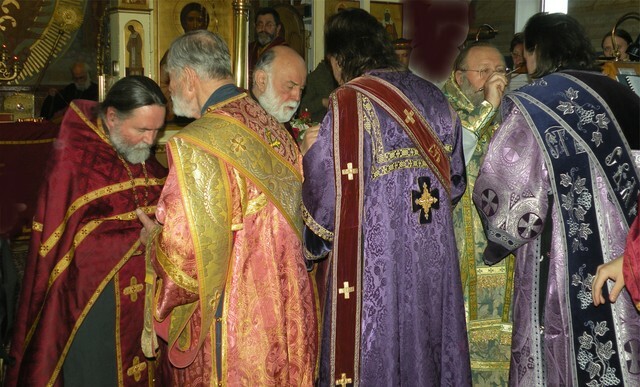 The Divine Liturgy was celebrated in a most glorified and prayerful manner! All were in a uplifted spirit. After the Cross Procession and Dismissal, the clergy, congregation and guests proceeded to a nearby Country Club for a luncheon banquet. This was a memorable event - it showed how parishes join together in celebrating each others Feast Days! This is how it should be - showing brotherly love to one another! Our Parish celebrated its Feast Day gloriously and prayerfully! Our Father George Larin and Father Ilya Gorsky were joined by Archpriest Nikolai Babitchouk of the All Russian Saints Orthodox Church (MP) from Pine Bush, NY; Archpriest Serge Lukianov of St. Nicholas Orthodox Church (ROCOR) of Red Bank, NJ; Archpriest Chad Williams of St. Alexander Nevsky Orthodox Church (ROCOR) of Richmond, ME and Hieromonk Father Dionisy from the Holy Trinity Monastery (ROCOR) in Jordanville. In addition, the Divine Liturgical Service was embellished by the presence of Protodeacon Joseph Yarostchuk from St John of Kronstadt Orthodox Church (ROCOR) in Utica, NY as well as Father Leonid Roschko from the Parish of Saint Nicholas Orthodox Church (ROCOR) in Red bank. NJ. Many came to pray with us and to partake of the festal trapeza served by the sisterhood after Divine Liturgy in the Church Hall. Easter Monday Services: Matins, Hours and Liturgy. A Cross Processiopn around the Church with numerous children carrying icons. This was followed by a sumptuous trapeza in the Church hall. The children then had an egg roll where all the toddlers were rewarded with prizes! Father George Larin, Matushka Catherine Larin, Matushka Irene Gorsky, Mrs. Marie Zaporoshan, Mr. Kirill Zaporoshan, Mrs. Anastasia Lopoukhine and Mr. Serge R. Lopoukhine visited with Father Vadim Arefiev at his St. John of Kronstadt Chapel in Brighton Beach, Brooklyn. We were warmly met by 15-20 parishioners. We celebrated Vespers together in the chapel after which a communal meal was shared. Father George Larin led a talk about Saint John (Maximovich) of Shanghai and San Fransisco.